The cool tone of wood and hints of red and green makes the place seem airy and cheerful. 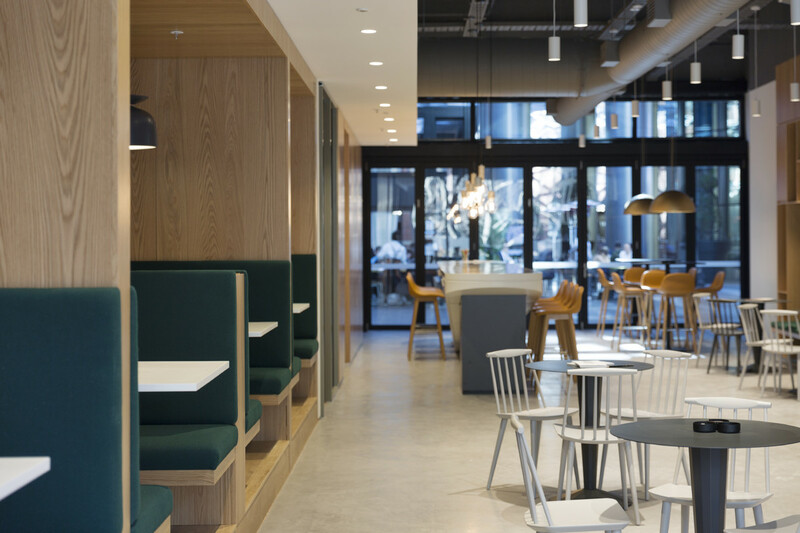 The cool tone of wood makes the place look fresh, light, airy and goes beautifully with the grey ductwork. Then, hints of red and green as the accent colors in the office helps create a lively surroundings, which is needed to lighten up one's mood. 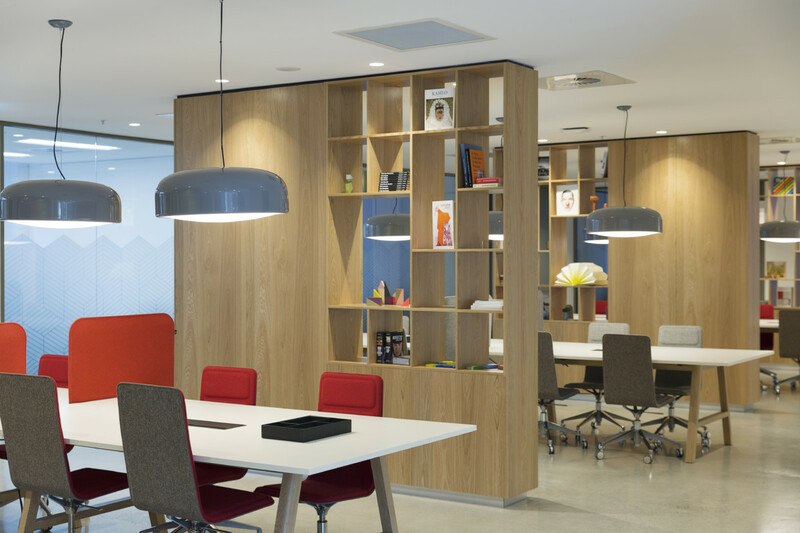 The board room is decorated with a lovely shelf filled with art, which is then illuminated by the elegant pendant lighting when it is not showered with natural light through glass walls. 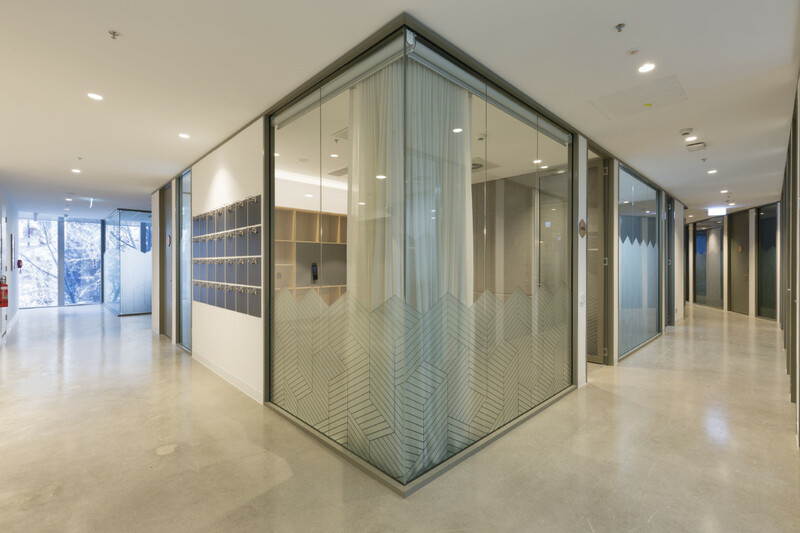 In similar ways, glass is utilized in other areas such as the meeting booth, working areas, and especially the coffee bar to liven up the calm surroundings. Also, even though natural light plays a key part in this design, the place does not shy away when night approaches. Various kinds of pendant lighting are selected to set the right mood for each area, each tends to have pale and light colors to harmonize with the furniture’s bright tone. 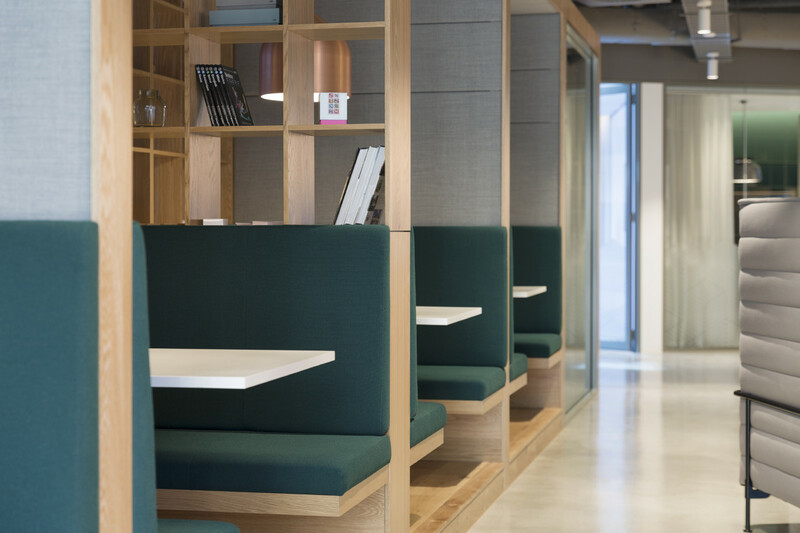 To wrap it up, Spaces Rialto is an ideal work place from day to night. Located at the heart of Melbourne, Spaces Rialto is in a building that defines the city's skyline. This business district is characterized by a mixture of multistory buildings, shop, restaurants and entertainment. 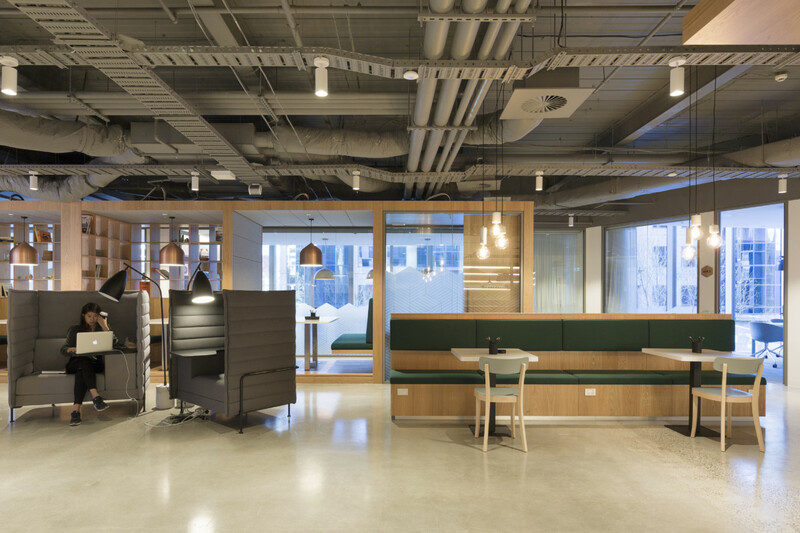 D&P designed the ground, first and second floor of the building to turn 2580 sqm into fully equipped private and shared workspaces as well as entertainment and relaxing areas. 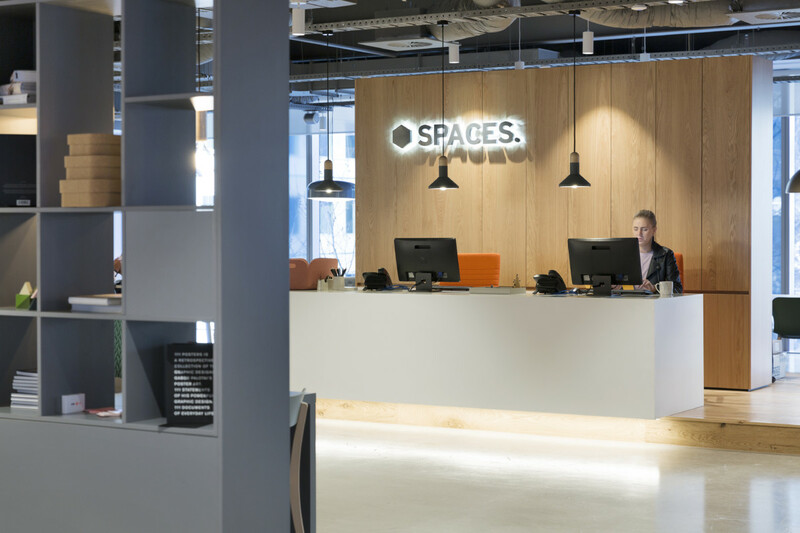 The architect team worked closely with Spaces to establish the branding for the office. 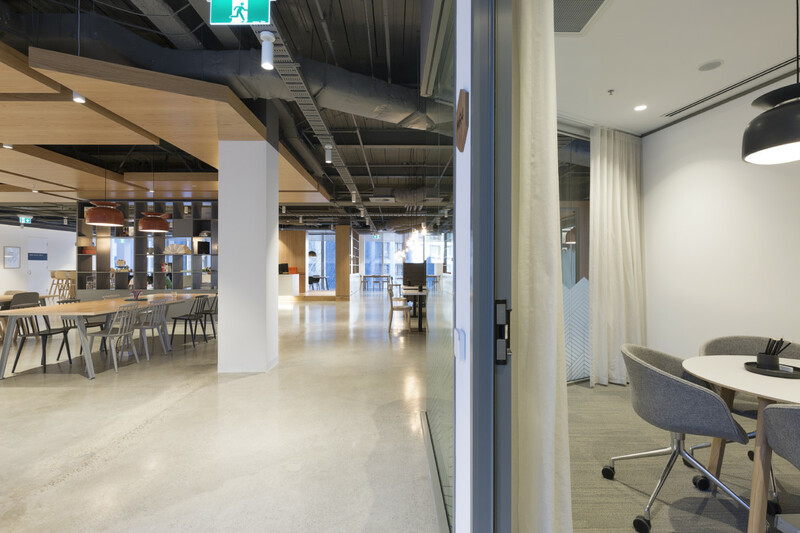 This enables us to achieve consistency throughout the project, which revolves around a contemporary industrial design with open, bright and connected corridors. The cool tone of wood makes the place look fresh, light, airy and goes beautifully with the grey ductwork. Then, hints of red and green as the accent colors in the office helps create a lively surroundings, which is needed to lighten up one's mood. 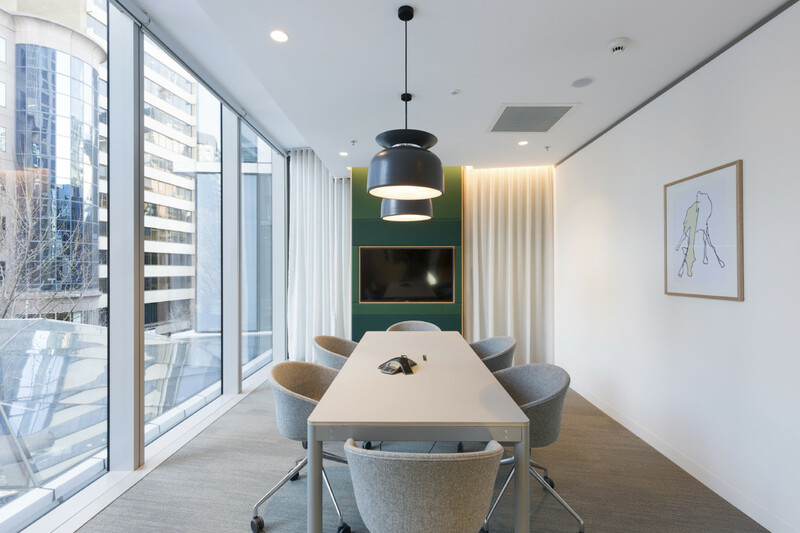 The board room is decorated with a love shelf filled with art, which is then illuminated by the elegant pendant lighting when it is not showered with natural light through glass walls. 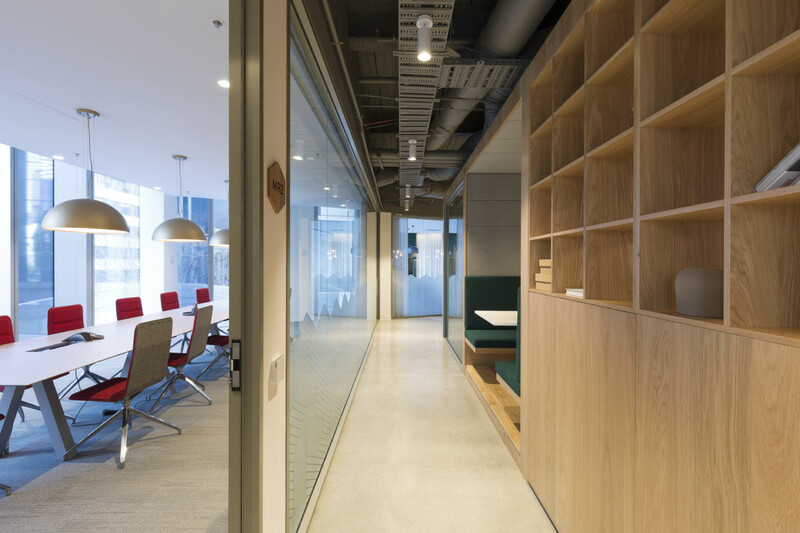 In similar ways, glass is utilized in other areas such as the meeting booth, working areas, and especially the coffee bar to liven up the calm surroundings. Also, even though natural light plays a key part in this design, the place does not shy away when night approaches. Various kinds of pendant lighting are selected to set the right mood for each area, each tends to have pale and light colors to harmonize with the furniture’s bright tone. 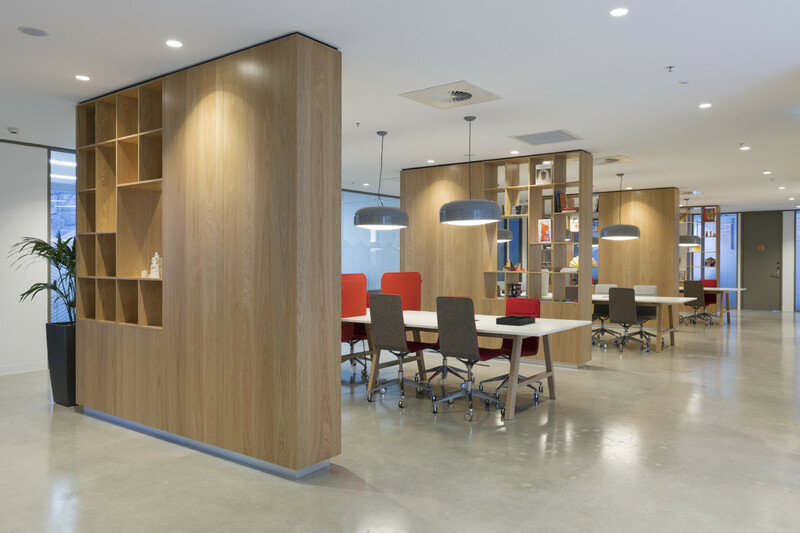 To wrap it up, our team went with the modern, balanced design to make Spaces Rialto an ideal workplace from day til night.